CHARLESTON, South Carolina -- An Air Force nighttime training mission at 19,000 feet turned disastrous Thursday when two F-16 fighter planes collided, sending one of the planes and its pilot, Jersey resident Captain Nicholas T. Giglio, into the Atlantic Ocean approximately 30 miles northeast of Charleston, South Carolina, according to military officials. Search efforts are ongoing and crews have not yet found the missing F-16 or Giglio, a 1995 graduate of Lacey Township High School, said Senior Master Sergeant Brad Fallin, at Shaw Air Force Base in Sumter, South Carolina. The pilot of the other plane, Capt. Lee Bryant, returned safely to the base, despite "significant damage" to the aircraft, Fallin said. Debris were found at 7 a.m. this morning from the fallen F-16, said officials. The F-16 fighter pilot, Nicholas Giglio, whose plane hit another fighter mid-air during night training exercises off the South Carolina coast was a graduate of Lacey High School. Both jets are single-seat aircraft that were participating in a routine 80-minute training flight designed to prepare pilots for nighttime missions. Colonel Joe Guastella, the Commander of the 20th Fighter Wing, says the collision took place toward the end of the exercise at 8:30 p.m. and had been flown several times in the days before the accident by Giglio. It was cloudy and raining with 3-foot seas at the time of the crash, the Coast Guard said. "We remain hopeful," said Guastella. Giglio, 32, has been a fighter pilot for 18 months and officials said he has been at Shaw Air Force Base in Sumter for a short time. He graduated in 2003 with a bachelor’s degree in aeronautical engineering from Embry-Riddle Aeronautical University in Dayton, Florida, a school known for developing students to be officers in the Air Force. According to a 2000 report in The Press of Atlantic City, Giglio helped his father, Jerry, emerge from a depression caused by the seizure-related death of Giglio’s older brother in 1997. The model trains that Jerry Giglio loved to share with his sons and daughter at Christmas time found new life as the centerpiece of an annual epilepsy fundraiser in Ocean County, an effort that helped lift the elder Giglio out of his grief. Giglio designed a model airfield, complete with lighting, for the display. Giglio’s mother, Helen Giglio, works as a special education teacher for the Cedar Creek Elementary School in Lanoka Harbor. "Our hopes, thoughts and prayers are with the family," said Vanessa Clark, assistant Superintendent of the Lacey Township School System. Rescue personnel have already searched about 4,000 square nautical miles, where searchers believe Giglio or his plane could have drifted, said Coast Guard spokesmen Bobby Nash. At one point, nearly 200 rescuers were involved in the search. Boats from the Coast Guard, Navy and commercial shipping entities participated. Fixed-wing aircraft and a helicopter also aided in the search. The effort has been hampered because emergency beacons attached to Giglio and the ejection seat of the aircraft failed to go off, said officials. The search was still ongoing last night. Coast Guard officials said a person can survive for at least 24 hours in the 74 degree water and ambient air temperature of the Atlantic. "Given that this was a military member, they would probably be in good shape and have a will to live. We would expect it would be quite a bit more than the 24 hours," McAllister said. 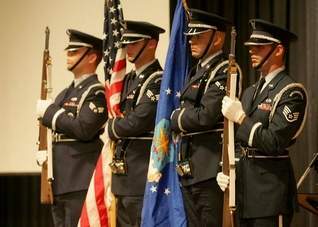 LACEY — Several hundred people came together Sunday afternoon in Lacey High School's auditorium to pay tribute to a graduate who reached his life's dream of being an Air Force fighter pilot and whose devotion to family, God and country were described as inspirational. The memorial service called a "Celebration of Life" honored Captain Nicholas Thomas Giglio who died on October 15, 2009, when his F-16 jet collided with another fighter pilot's aircraft. The 32-year-old fighter pilot was unable to eject after the collision, which took place about 40 miles northeast of Charleston, South Carolina. Giglio was a 1995 graduate of Lacey High School. Members of his family, lifelong friends and clergy spoke about Giglio, describing him as a soft-spoken, kind man who, like his grandfather, had a strong sense of duty to his country as a member of the Air Force. The ceremony began with a military honor guard and continued with two Christian musical performances. Enlarged photographs of Giglio with members of his family were present on stage. Giglio had been assigned to the Shaw Air Force Base's 20th Fighter Wing. He had been a fighter pilot for 18 months and was part of the 77th Fighter Squadron at the time of the accident. He was in training for a scheduled deployment to Iraq early next year. While a student, Giglio was a member of the Civil Air Patrol and was active in a number of school activities. He joined the school's marching band to be closer to a student who would later become his wife. Lee Giglio, who is pregnant with the couple's second child, spoke during the ceremony about their life together. "We were best friends, sweethearts and soul mates." "I was a freshman, and he was in 8th grade. I wasn't an easy catch, and he spent three years of pursuit, but he would walk me to class and bring me candy canes at Christmas time. It was on October 3, 1993, when he first asked me out. That was the beginning of a fun and loving relationship for the next 16 years." Despite fears of a long distance relationship between her attendance at a college in Pennsylvania and his Air Force training, the couple dated for five years and wed on July 1, 2000. "He proposed near a Ruby Tuesdays in Scranton and read me a Valentine's Day poem, which asked me to marry him. Our wedding day was just perfect and during the reception he and several of his ROTC buddies sang "You've Lost that Loving Feeling" from that scene in Top Gun. It was always his lifelong dream to become a pilot," she added. "He loved being a father. He loved to go places with Grace. He called her his "Grace Face.' Nick was so excited about learning of our expecting a second child," his wife added. "He was a shining example for our town. He reached his life's dream," Lacey Committeeman Dave Most told Giglio's father Jerry, prior to the ceremony. "This turnout is amazing," school board member Jack Martenak said of the large crowd that nearly filled the auditorium. Jerry Giglio said his son will be buried at Arlington National Cemetery on December 18, 2009, which was his son's birthday. Giglio's mother, Helen, is a special education teacher at the Cedar Creek Elementary School. Last year, her son served as a speaker for career day at the school. "Today is about how he touched our lives and how he lives on in heaven," Lee Giglio said. She thanked family, friends, and the community for all the support her family has received. A fund has been established for the family. Checks can be made out to: AWCF (Giglio Family) and can be mailed to AWCF P.O. Box 1553 Front Royal, Virginia 22630-0033. Those wishing to make donations can also visit AirWarriorCourage.org. All donations must be specified for the Giglio family. For information, call (540) 636-9798.